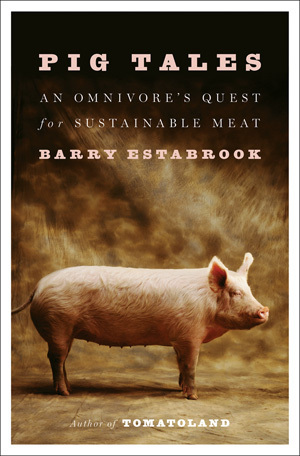 First up is Pig Tales: An Omnivore's Quest for Sustainable Meat by Barry Estabrook. "An eye-opening investigation of the commercial pork industry and an inspiring alternative to the way pigs are raised and consumed in America. Barry Estabrook, author of the New York Times bestseller Tomatoland and a writer of “great skill and compassion” (Eric Schlosser), now explores the dark side of the American pork industry. Drawing on his personal experiences raising pigs as well as his sharp investigative instincts, Estabrook covers the range of the human-porcine experience. He embarks on nocturnal feral pig hunts in Texas. He visits farmers who raise animals in vast confinement barns for Smithfield and Tyson, two of the country’s biggest pork producers. And he describes the threat of infectious disease and the possible contamination of our food supply. Through these stories shines Estabrook’s abiding love for these remarkable creatures. Pigs are social, self-aware, and playful, not to mention smart enough to master the typical house dog commands of “sit, stay, come” twice as fast as your average pooch. With the cognitive abilities of at least three-year-olds, they can even learn to operate a modified computer. Unfortunately for the pigs, they’re also delicious to eat. Estabrook shows how these creatures are all too often subjected to lives of suffering in confinement and squalor, sustained on a drug-laced diet just long enough to reach slaughter weight, then killed on mechanized disassembly lines. But it doesn’t have to be this way. Pig Tales presents a lively portrait of those farmers who are taking an alternative approach, like one Danish producer that has a far more eco-friendly and humane system of pork production, and new, small family farms with free-range heritage pigs raised on antibiotic-free diets. It is possible to raise pigs responsibly and respectfully in a way that is good for producers, consumers, and some of the top chefs in America. 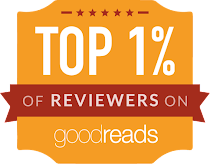 Provocative, witty, and deeply informed, Pig Tales is bound to spark conversation at dinner tables across America." 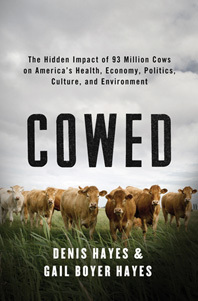 Next up is Cowed: The Hidden Impact of 93 Million Cows on America's Health, Economy, Politics, Culture and Environment by Denis Hayes and Gail Boyer Hayes.
" From leading ecology advocates, a revealing look at our dependence on cows and a passionate appeal for sustainable living. Long ago, cows provided food and labor to settlers taming the wild frontier and helped the loggers, ranchers, and farmers who shaped the country’s landscape. Our society is built on the backs of bovines who indelibly stamped our culture, politics, and economics. But our national herd has doubled in size over the past hundred years to 93 million, with devastating consequences for the country’s soil and water. Our love affair with dairy and hamburgers doesn’t help either: eating one pound of beef produces a greater carbon footprint than burning a gallon of gasoline. Denis and Gail Hayes begin their story by tracing the co-evolution of cows and humans, starting with majestic horned aurochs, before taking us through the birth of today’s feedlot farms and the threat of mad cow disease. The authors show how cattle farming today has depleted America’s largest aquifer, created festering lagoons of animal waste, and drastically increased methane production. In their quest to find fresh solutions to our bovine problem, the authors take us to farms across the country from Vermont to Washington. They visit worm ranchers who compost cow waste, learn that feeding cows oregano yields surprising benefits, talk to sustainable farmers who care for their cows while contributing to their communities, and point toward a future in which we eat less, but better, beef. In a deeply researched, engagingly personal narrative, Denis and Gail Hayes provide a glimpse into what we can do now to provide a better future for cows, humans, and the world we inhabit. They show how our relationship with cows is part of the story of America itself."